Home » Posts Tagged "Gadgetry"
My USB tuner, as seen in the previous post, arrived. Works okay, one surprise (because I didn’t read the product description carefully): it is an ATSC tuner ONLY, which means it won’t pick up NTSC. This will be irrelevant after 2009 anyway. I was impressed with how good the images were with a little tiny antenna. It’s UHF frequencies, which means the antennas are going to be small for the equivalent wavelength, but which also means the signal is very directional. 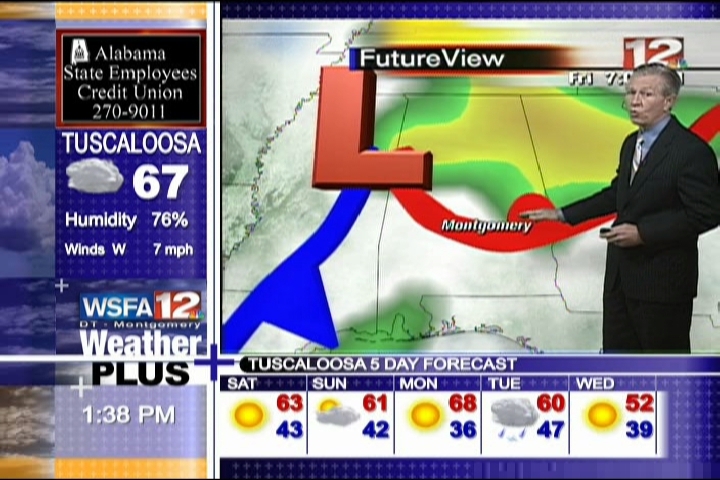 The TV stations (at least 2 of them) are putting a strong signal into Prattville. The adapter uses a standard 75 ohm antenna connector, so I could put a better antenna outside or in my attic and get better results. Should serve the purpose of allowing us to see some TV (especially the weather and news) if cable and/or power go out (at least for an hour or so on the laptop). Here’s a screenshot I captured with it – of Dan Atkins with WSFA (from their 12.2 weather sub-channel) – click on the picture for a larger image. In addition to my being banged up and currently bed-ridden, a tornado went through my fair city this Sunday. Some guys have all the luck (I know, at least it didn’t hit my house). The power was out for over an hour, and cable was out for about 24 hours. At some point in the festivities, I got out my old Radio Shack 1″ screen LCD TV, and it occured to me as we were watching the news on it that after February 2009 (as of this writing), this thing will be useful only as a paperweight. So I got to looking for portable TVs with an ATSC tuner. While there are a few models out there, my searching led me to this USB tuner. Using my laptop (or any other computer, provided I have power), I’ll be able to pull in HDTV signals off the air. It even provides for some other goodies, like recording programs. And best of all, my laptop screen, while not a true 1080, beats the heck out of the old Radio Shack 1″ screen.